New Zealand currently produces just 2% of the global supply but is the ninth largest international avocado exporter. There are over 4,000 hectares of avocado trees planted in New Zealand, primarily in the Bay of Plenty and Northland. Global and local demand for the super food is sky rocketing. Avocado production does have very irregular swings in volume and this needs to be accounted for when planning your orchard however growers are reaching higher returns than ever before. Coupled with an amazing lifestyle growing avocados is undoubtedly a very exciting prospect. Where can I get information on how to grow avocados? The majority of packhouses have grower representatives and technical teams who support growers with advice and knowledge. Independent orchard management companies also offer a full range of services and equipment for growers. Field days, publications and knowledge sharing amongst growers will increase your knowledge base. A list of packhouses and orchard management companies can be found in our industry directory. Vital information about how to grow avocados. Latest research publications and findings. Tools and resources to help improve your orchard. Directory of industry companies and contractors. Material on pests and diseases. Videos and articles on orchard management. Best practice recommendations – pruning, thinning, new plantings and more. Links to industry systems pages including Avogreen, spray diary, avotools and export registration. A range of grower manuals and guides are available for purchase in our avoshop. Irrigation is required for heavy crops in areas with low summer rainfall and possible frost protection. If you’re buying and exiting orchard, it’s important to find out weather it already has irrigation. Seedlings – Hass grafted onto Zutano rootstocks. Until 2012, nearly all New Zealand avocado trees were this variety. Clonals – Hass grafted onto imported rootstocks that are propagated clonally for commercial use. Clonal varieties have been selected for New Zealand conditions. Trees are normally grown in a nursery for two years before being sold. Growers may get a crop at year three and full production after six to eight years. See the NZ Avocado website for information on different tree cultivars. Planting density is intended to maximise yield per hectare. When choosing your orchard design, take into account light, future pruning and the health of the soil. Planting density can vary from high-density planting of 400 trees/ha (five by five metre spacing) to lower density of 100 trees/ha (10 by 10m spacing). High density plantings can be thinned later to avoid trees shading each other. There are currently a number of commercial trials looking at different tree spacing. Your final decision should be based on what you want to achieve moving forward. 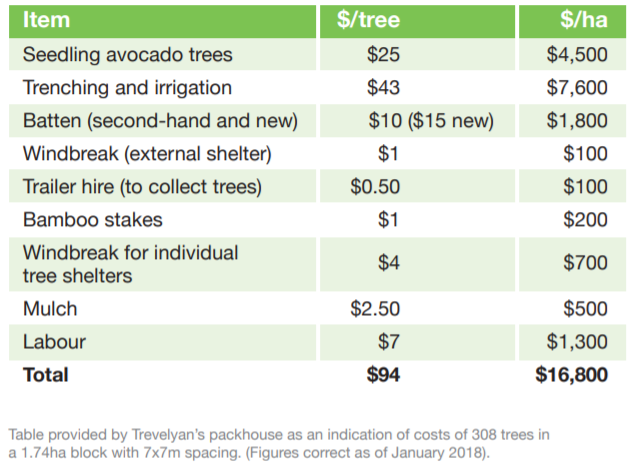 How much will it cost to establish an avocado orchard? 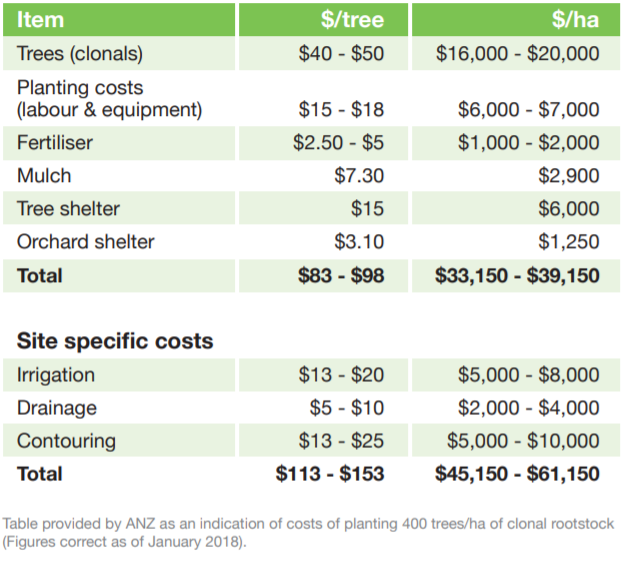 Below are two example costings for planting seedling and clonals. Please take independent advice in regard to what might suit your land and management style. All information is a guide only. Other orchard costs include; picking/harvesting, fertiliser, pruning/thinning, pollination, phytophthora control, mulch, irrigation, spraying and general maintenance. A big proportion of this is labour focused. Aside from the initial establishment costs listed above, ongoing operating costs differ by orchard and a grower needs to weigh up how much they do themselves versus contracting out. What is the yield history and export pack out rate of the existing orchard? Historical data on the production from your orchard is available from NZ Avocado with permission from the previous owner. This can be included as a condition in the sale and purchase agreement of the property. Are the estimates of income and expense in your proposed budget realistic? The yield from your orchard measured in tonnes or trays per hectare. Your export packout. Most class 1 fruit is exported, class 2 fruit sold in New Zealand and class 3 sold for processing. The return from both export and the New Zealand market achieved by your exporter or marketer. Generally returns are reported as orchard gate return (OGR) per tray. These are often separately reported for the export and New Zealand markets. 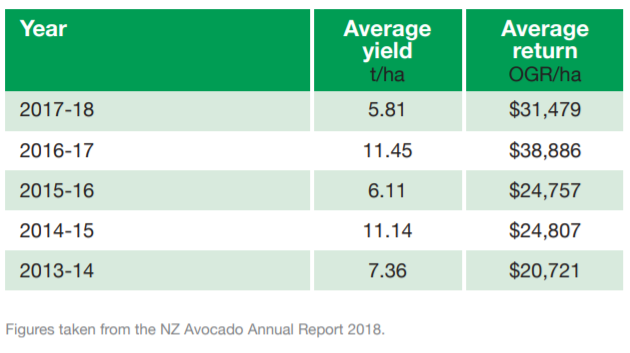 NZ Avocado reports OGR per hectare for the industry as a whole in their annual report. The global demand for avocados and current lack of supply has pushed the returns for avocados to very high levels. Orchards may wish to prudently budget at $12 – $20 OGR per tray. Orchard gate return (OGR) is the industry metric used to measure money an orchardist gets before on-orchard costs. Who can help me take care of my orchard? Growers can either manage their own orchard or contract orchard management services. Even the most experienced growers will utilise industry consultants for on-orchard services including canopy management and a spray and fertiliser programme. How and when do I harvest my fruit? Avocados do not ripen on the tree and must be at the correct maturity before they can be harvested to ensure premium quality fruit in market. Your packhouse will monitor your crop and let you know when it is ready to be harvested. Harvest dates are dependent on dry matter (maturity) readings, residue clearance, crop flow into market and weather. Once harvested, avocados only have a shelf life of approximately 30 days so are ‘stored’ on the tree to manage flow into market. Payments will come from your packer/exporter under your commercial contract with them. Where does my fruit go? 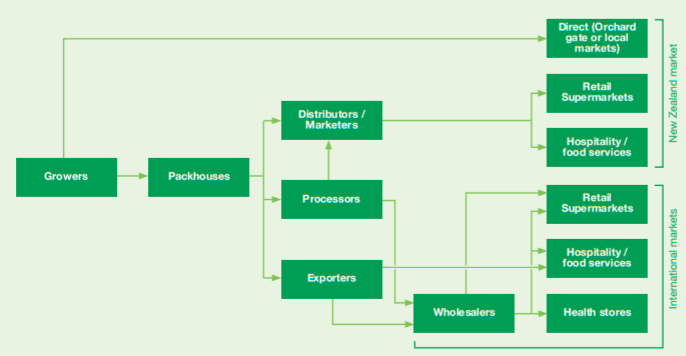 Market structure for New Zealand grown avocados. 60-65% of New Zealand’s avocado crop is exported each year between August and February. 25-30% is sold over 12 months in the New Zealand market with 8-10% being sold for processing (e.g. oil). Australia is the largest export market taking around 80% of export volumes. Exporters are developing Asian markets including South Korea, Japan, Thailand, Taiwan, Singapore, India and China. Exporters are all members of the Avocado Exporter Council (AVEC) and work with NZ Avocado to market and promote New Zealand avocados in all markets. What do I have to do if I want to export my avocados? PPIN (Orchard identification number) – If you are taking over the ownership of an existing avocado orchard, are developing a new avocado orchard or are leasing an avocado orchard you need to have a PPIN. This is required to become an NZ Avocado Growers Association (NZAGA) member. Please note that if you are taking over an existing orchard with an existing PPIN you will need to arrange for a new PPIN to reflect the change in ownership. AvoGreen® compliance – All growers intending to export avocados must be AvoGreen® compliant as of 1 November of the preceding season. AvoGreen® is a responsible and auditable avocado production system which uses the principles of Integrated Pest Management to ensure pesticides are used only when pests are identified. Growers can choose to either engage an operator to do their monitoring of pests or monitor as an Owner-operator by becoming an NZ Avocado accredited pest monitor. Contract with packer and exporter – Each season a grower must contract with a packer and exporter to pack and market their avocados on their behalf. It is the grower’s responsibility to read and understand their packhouse/exporter contracts and raise any concerns they may have with their representative. Export registration – Growers wanting to export avocados must register for export with NZ Avocado. Spray diary management – Each orchard must have an up-to-date spray diary. Once a grower has an agreed pick date with their packer, a harvest entry must be created within the diary, accompanied by a declaration that the diary is true and correct. What does the future for avocados look like? There is a surge in orchard plantings in New Zealand as a result of the recent returns achieved. There are 3,800 hectares in production with an expected 1,000 hectares likely to begin producing in the next two to five years. The industry is confident there is market demand across the export and New Zealand market provided we continue to produce high quality avocados that meet consumer needs. The industry has five year goals that continue to see growth in sales, increases in supply and the development of the China market. Avocados are a horticultural crop and this comes with a number of risks. Biosecurity is the industry’s biggest risk and NZ Avocado is proactive to mitigate the risk of biosecurity events in the industry. 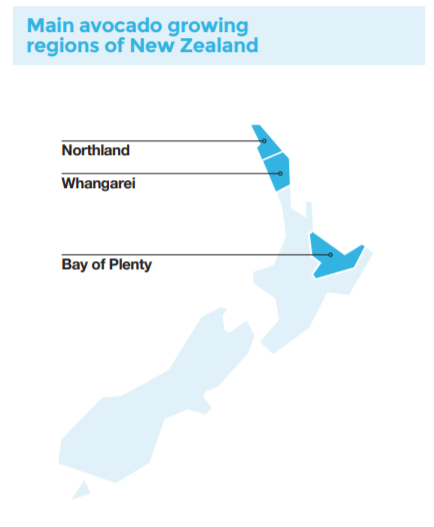 There are a number of potential pest and pathogens that New Zealand currently does not have. The industry has signed an agreement with the Government that includes a comprehensive plan for mitigating key biosecurity risks and a response pathway for any incursions that occur. As with any horticultural industry pest and disease are always a risk factor for avocado growers. The NZ Avocado industry has an integrated pest monitoring system, AvoGreen® which monitors for pests of concern and ensures that pesticides are only used when required. The two main diseases that affect avocados are root rot caused by Phytophthora cinnamomi and fruit rots caused by a range of fungi. These diseases are controlled with spray/chemical applications and integrated management systems based around good nutrition, orchard hygiene, careful handling, post-harvest treatment and temperature control. Avocados originate from Central America therefore New Zealand growers face challenges from our cool, wet and windy climate. The influence of these factors can be managed by appropriate site selection and site preparation. Hass avocados are inherently alternate bearing, meaning they over crop one season and under crop the next season. Additionally, avocado yields can be negatively impacted by weather challenges. This results in very irregular yields from one season to the next. Research and trials to help mitigate irregular bearing in New Zealand are being undertaken and growers should be proactive on their orchard to mitigate these risks. Additionally, poor orchard management and mishandling during picking and packing, can seriously affect the yield and quality of fruit being produced from your orchard. Click here for more information on the two year growth cycle of an avocado tree. It is also important to find out whether the plants on the orchard were sourced from an NZAGA accredited nursery. How can NZ Avocado help? NZ Avocado is the industry body for the avocado product group. We work alongside avocado growers to pack goodness of New Zealand into every slice of avocado we share with the world. We also co-ordinate and disseminate relevant industry information through our industry website, on-orchard field days, our industry newsletter, AvoConnect and our industry magazine, Avoscene. We lobby and liaise with Government for the good of our growers. Should you require further technical help, we recommend you contact a consultant – you’ll find a list of consultants and other industry contacts in our directory. Download our new grower booklet below. The information provided is to the best of our knowledge correct at time of publishing. The reader/user should treat this information as a guide. NZ Avocado Industry Ltd shall not be liable for errors or omissions or for losses and other consequences resulting from this information. Share the post "Becoming an avocado grower"